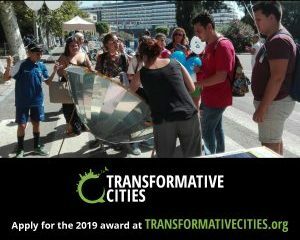 (15th November 2018) :- The 2019 edition of the Transformative Cities initiative opens today with an open call to communities worldwide who are finding inspiring solutions in the face of water, energy, food and housing crises, to share their story and apply for the #TransformativeCities Peoples Choice Award. Transformative Cities is an opportunity for progressive local governments, municipalist coalitions, social movements and civil society organizations to popularise and share their experiences of building solutions to our planet’s systemic economic, social, political and ecological crisis. The Transformative Cities initiative is launched by a group of regional and international organisations (in alphabetical order): ECOLISE, the European network for community-led initiatives on climate change and sustainability, Friends of the Earth International (FoEI), Global network of continental networks committed to the promotion of Social Solidarity Economy (RIPESS), Habitat International Coalition (HIC), the Global Platform for the Right to the City (GPR2C) and the Transnational Institute (TNI).